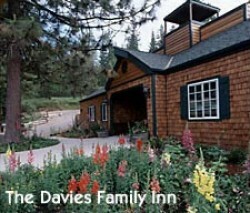 Nestled in the heart of the Motherlode on the old 1854 stage route to "Newtown", The Davies Family Inn is located five miles east of the Gold Rush Town of Placerville along Fort Jim Road. The rustic elegance of this mid-1800's era log cabin homestead has been preserved and enhanced by the Davies family to promote the look and feel of frontier living with the convenience of modern times. The beauty of this woodsy setting speaks softly of a revitalizing tranquility, unique in our fast paced world. The Davies Family Inn is equipped for weddings and events of every size and kind and welcomes inquiries into use of just the events facility or whole inn occupancy in addition to bed and breakfast lodging. Lodging is provided in both the Main Lodge and in two cabins on the property. The main lodge offers a comfortable sitting room, breakfast nook and large dining room for the use of all of our guests. Upstairs, you will find an open beam ceiling and this room has a queen sized bed. The adjacent loft with a double bed and open to the floor below can be rented for an additional fee along with The Room in The Main Lodge. Both cabins are described below. Come stay with us, play in the surrounding forests, lakes and streams, take a picnic to Apple Hill or visit local vineyards to taste fine wines. Experience your dream wedding, produce a classic corporate event, family reunion, birthday party, commemorative service or just make your time your own at The Davies Family Inn! This comfortable cabin with chinked log walls and open beamed ceiling features not only a king sized bed and private bath, but also a sitting and dining area. It also has a romantic woodstove and a kitchen area. The kitchen area includes sink, microwave, refrigerator and coffee maker. This cabin has two separate suites available for our guests. The Carpenter Suite has an airy feel to it and features a queen sized bed, full bath with shower, woodstove, coffee maker and refrigerator. The Raffetto Suite has a more western feel to it with handsome wooden walls and wood floor. It features a queen size bed, full bath with shower, woodstove, coffee maker and refrigerator. Lodging Rates: Rates reflect double occupancy as follows: Fridays & Holidays range from $135 to $150 per night; Saturday Night Only from $150 to $175; and weeknights and additional nights $120 to $135 per night plus 10% El Dorado County Occupancy Tax. On the west side of the meadow, our events facility features the Carriage House equipped with dressing rooms, catering kitchen, bar and restrooms. Our pavilion tent seats up to 200 people and is surrounded by lawn where umbrella tables can almost double the seating capacity. A ceremony canopy and catering tent add to the covered area. For Events Contact Vicki at 530-647-6760.